Experience the best of this Bowling Green hotel - located near I-75, across from Bowling Green State University. 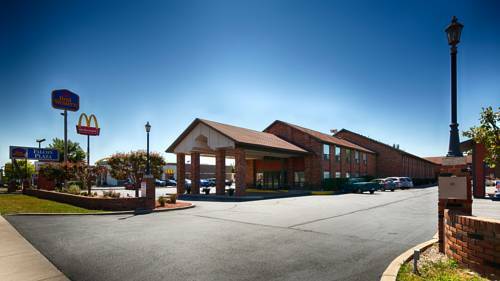 The Best Western Falcon Plaza is ideally situated across from Bowling Green State University in Bowling Green, Ohio, perfect for visiting friends and family. Guests staying at this hotel can enjoy local events including the annual National Tractor Pulling Championship or university sporting events at the Bowling Green State University campus. This prime location in Bowling Green is also close to Cedar Point, Toledo Zoo and Bass Pro Shop. This Bowling Green hotel offers thoughtfully appointed guest rooms and suites, each complete with cable satellite television with HBO and high-speed Internet access. Jacuzzi suites, family suites or business rooms are available upon request. Guests staying at this Bowling Green hotel will appreciate a complimentary continental breakfast. Additional amenities include a business center, meeting facilities, fitness center, and hot tub. For superior customer service and a convenient location, make a reservation at the Best Western Falcon Plaza! From: Interstate 75. Take Exit 181 for .75 mile. The Best Western Falcon Plaza is on State Road 64 opposite Bowling Green State University. ~59 miles from Bowling Green. ~67 miles from Bowling Green.